I wear shoes every day, all year long. These are the new shoes I got for my birthday this year. For my birthday, Abby agreed to let me order new shoes from Zappos.com. (Before you ask me why I didn’t buy locally, ask the locals why the same shoes are 20% more.) 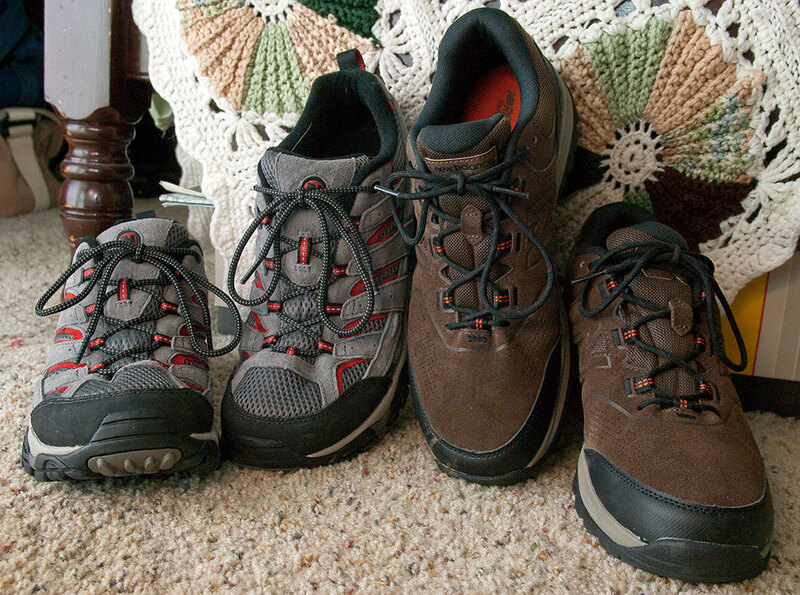 I got a pair of brown New Balance casual walking shoes for everyday wear in my office casual environment at work, and another pair of Merrill Moab 2 Ventilators. I got my first pair of Moab’s because of the name: Abby and I got married in Moab, Utah, but that led to the discovery that these are best shoes I’ve ever owned. I have the healthiest feet of anyone I know. My feet never hurt and they are anatomically ideal. I don’t require wide sizes or insole inserts of any kind. I wear shoes all day, every day, all year long. It’s possible the shoe companies are sneaking in at night to measure my feet and make shoes exactly for them. Hawken’s idea of posing for a portrait is to tackle me and slobber all over me. The shoes look good, though, right? Also among the huge and the healthy is Hawken, our six month old Irish Wolfhound. Ten days ago he weighed in at 108 pounds, so he is still growing, but he is well and loves us to pieces. Abby has taken to putting bandanas on him. Last night I tried, but he wants to play with the bandana as a toy, so it’s really a two-person job. 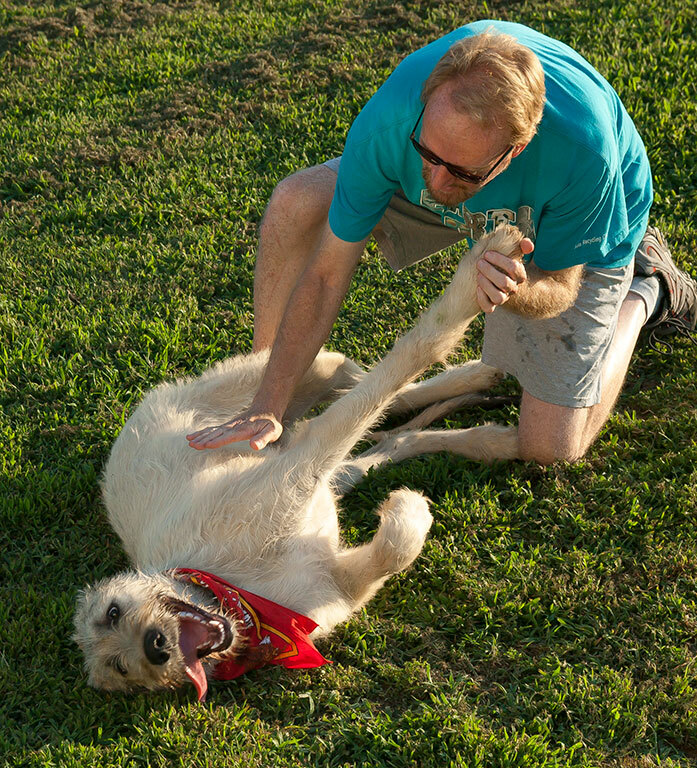 Once we got his Harley Davidson bandana on him, I asked Abby to make a few pictures of us, which was particularly fun when he decided to knock me down and cover me in huge-tongue dog slobber. I finally got Hawken to pose for this image by rubbing his belly. While I don’t have any particular problems with my feet, it’s been pretty rare that I found a pair of shoes that fit incredibly well. My recent purchase of Merrills might be the first time it’s happened (but the number is way off — I had to buy a 12, when I’m a 10.5 or 11 in every other brand). Wil, Merrill’s are small on some people. I wear 11.5 in all brands now. When it comes to getting shoes to wear right, I do tend to make the laces tighter toward the toe than most people do.